A mouse has to do what a mouse has to do. Ragweed is determined to see the world. He leaves his family and cozy country home and sets off by train for the big city. What wonders await him: music, excitement, new friends … and cunning, carnivorous cats! Silversides is the purring president of F.E.A.R. (Felines Enraged About Rodents), a group dedicated to keeping cats on top, people in the middle, and mice on the bottom. 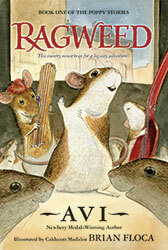 Can Ragweed and his motley yet musical crew of city nice—Clutch, Dipstick, Lugnut, and Blinker—band together to fight their feline foe?